Alright, that’s made up. But I have seen several rather over-revealing meeting titles on my way down various corridors recently. Technology for setting up meetings is getting pretty sophisticated these days. In one or two office buildings I’ve been in recently, there is a small touch-screen on the wall just outside each meeting room showing the subject of the meeting taking place therein. It’s all linked to the everyone’s Outlook (Exchange) calendars. You invite your colleague/s, give the meeting a subject, then you invite the room as a “resource”. 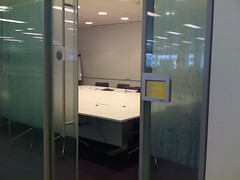 The subject – and the name of the organiser – then appears on the touchscreen as the meeting takes place. So, as a friendly word of advice, be careful what you call your meetings. More common and less high tech is for people to print out their daily agenda and walk around with it for all to see. While we’re on the subject (as it were), and for good measure, put as much meaning in to the meeting title as possible, without giving away all your company’s top-secret information. A popular bug-bear is when a meeting request arrives with the subject “Catch-up and coffee with Bob” or something similar. Of course it makes perfect sense to the organiser, but once Bob’s accepted the meeting requets, it doesn’t provide Bob with many clues at a glance!